Kauai Oceanfront Condo Rentals | Hula Now Offers Kauai Oceanfront Condo Rentals on the Magical Garden Island of Kauai from the Beauty of the Pristine Beaches to the Scenic Valleys with Waterfalls. 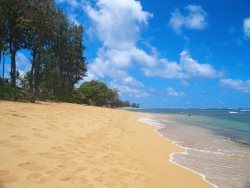 Enjoy our oceanfront resorts Kapaa Sands, Islander on the Beach and Kauai Beach Resort. You will know you made it to paradise with Kapaa Sands Unit 19 that is Almost Oceanfront. Overall, the condo was great. Perfect! Loved it! Looked just like the photos. Charming and relaxing. Everything it said it would be. Wonderful, clean, comfortable bungalow feel. Quiet and good view. Lovely complex that had a quiet and relaxed feel to it. Some minor issues with the dishwasher and safe were encountered the first day but quickly resolved. Ocean sounds were wonderful despite not being ocean front location. A great feature is that each upper unit has its own staircase going up so that unlike other complexes, you aren't listening to people going up and down the stairs talking all day and night. A final suggestion is that some sort of sound barrier be used in the units that have the adjoining door. The door has a gap at the bottom of close to 1/2 inch and voices carry thru very easily. Our review is EXCELLENT!! We had a delightful time and will return again. We had a chance to look at many properties while staying in Kapaa and think Kapaa Sands is superior to many. An extra treat was meeting Mary and Woody who owned the unit below us. They provided us with information on places to go and eat and what it was like to spend time on the island for the last 30 years. We certainly encountered the ALOHA spirit wherever we turned. Thanks to everyone. Excellent experience working with the team. Yes, it surely did meet our expectations. The bathroom was tiny, however we were pretty much in it to sleep! Over all, we had a great experience and will return in the future! The best part was to be able to hear the ocean and the view was actually very nice! loved how quiet this property was. The location was very good. Also, it was super nice to have the beach chairs and cooler!! Can't wait to come back to Kauai! All good. It was clean and the bed was great! Very easy and friendly. The condo was beautiful, in an exquisite location, and I would definitely recommend it to anyone.